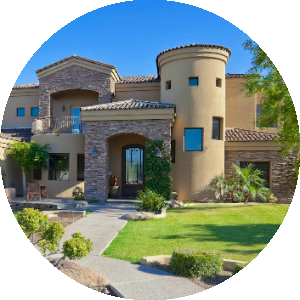 Find the newest Desert Ridge homes for sale & real estate listings in Phoenix AZ below! Desert Ridge is a vibrant 5,700 acre Master-Planned Community, located in Northeast Phoenix. As one of Arizona's largest communities, it is expected to ultimately reach 50,000 residents. 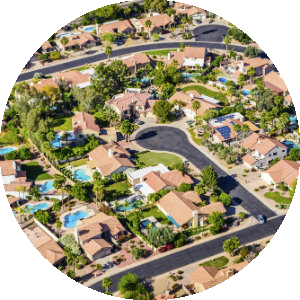 The community already boasts an amazing assortment of residential, commercial, recreational, health-care and employment opportunities for it's residents, and is one of the most popular places that many Phoenix residents are proud to call home. 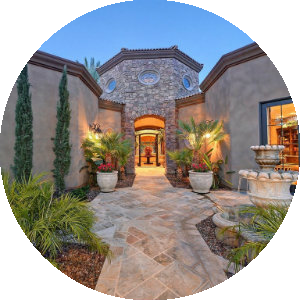 For information about Desert Ridge properties for sale or to schedule a showing, contact your Phoenix Arizona real estate experts today. Great Schools. Desert Ridge lies within the Paradise Valley Unified School District, which is the 4th largest school district in the State of Arizona. PVUSD is known as one of the top school districts in Arizona, and is consistently recognized as such by the AZ Department of Education. Location. Desert Ridge is conveniently located just 2 minutes North of the 101 Freeway, which serves as a major arterial to Scottsdale, Tempe, and East Phoenix. The Desert Ridge Marketplace is located within Desert Ridge, and is known for it's incredible shopping, dining, and arts/entertainment. The popular Kierland Shopping District is located just 5 minutes from the community as well. Both Downtown Phoenix and Sky Harbor Airport are only 20-25 minutes away. Housing Diversity. Desert Ridge offers everything from apartment-style living to luxury homes, and everything in-between. The area is known for having residents who choose to "move-up" within the community, rather than moving to other areas. Outdoor Activities/Recreation. Desert Ridge offers numerous biking/hiking trails throughout the community, as well as an incredible recreation center, located within Aviano. There are seven parks strategically located throughout the community, which tend to be very popular with the residents. In addition, there are 10+ golf courses within a 10 minute drive of Desert Ridge. Shopping. People from all over Phoenix love the Desert Ridge Marketplace, and it acts as the centerpiece of the community. Incredible shopping, movie theaters, restaurants, and a vibrant night-life make this a hotspot for residents of Desert Ridge. Upscale Resorts. The JW Marriot Resort sits in the heart of Desert Ridge, and is a favorite destination of out-of-town visitors, as well as families who want to do a "stay-vacation", especially during the hot summer months. The Westin Kierland Resort & Spa is a short 5 minute drive from Desert Ridge as well. Desert Ridge has three elementary schools (Desert Trails, Quail Run, and Sunset Canyon) for grades K-6, one middle school (Explorer) for grades 6-8, and one high school (Pinnacle). All of the schools fall within the Paradise Valley Unified School District, which is considered to by one of the finest school districts in Arizona.